A biography of the Wombles’ creator, courtesy of The Official Wombles Website. Elisabeth Beresford (Liza) was born in Paris in 1926, although her family home was in England. Her father was a successful novelist who also worked as a book reviewer for several newspapers. The goddaughter of Walter de la Mare (who dedicated several poems to her) and children’s writer Eleanor Farjeon, Elisabeth enjoyed many literary connections; her parents’ friends included HG Wells, George Bernard Shaw, John Galsworthy, Hugh Walpole, Somerset Maugham and DH Lawrence. The house was full of books and soon she became a compulsive reader. After 18 months as a Wren, Elisabeth started work as a ghostwriter (specialising in writing speeches for the rich and famous). She began training as a journalist and was soon writing radio, film and television columns and working for the BBC as a radio reporter. Exciting trips to Australia, South Africa and the West Indies with her sports commentator husband Max Robertson led to more children’s books and two TV series: Seven Days To Sydney and Come To The Caribbean. 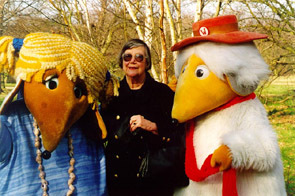 The Wombles of Wimbledon Common were inspired by a child’s mispronunciation one Christmas, when Elisabeth took her children to Wimbledon Common for a Boxing Day stroll. Back home that same day, Elisabeth made out a list of Womble names. The characters developed along with their names… Great Uncle Bulgaria was based on her father-in-law, Tobermory resembled her brother (a skilled inventor), Orinoco her son, and Madame Cholet was based on her mother. The Wombles’ names came from sources as different as the town where Elisabeth’s daughter went on a French exchange and the name of the college attended by a nephew. The first Wombles book was published in 1968 and, after it was broadcast on Jackanory, the BBC decided to make an animated series. The Wombles’ motto ‘Make Good Use of Bad Rubbish’ and their passion for recycling was far ahead of its time and captured the imagination of children everywhere, who began to organise Womble Clearing Up Groups. Thirty five-minute films were broadcast on BBC1 accompanied by Mike Batt’s music and The Wombles theme song, Underground Overground, Wombling Free. Characterised by actor Bernard Cribbins’ wonderful voices and the creations of master-puppet maker Ivor Wood, the popularity of The Wombles grew rapidly. Fanmail arrived by the sackful from around the world. Elisabeth took part in live phone-ins with children in Australia, and in South Africa she enchanted a thousand Zulu warriors with Womble stories. Back in England, Elisabeth made countless public appearances with The Wombles and headed up get-togethers up and down the country. 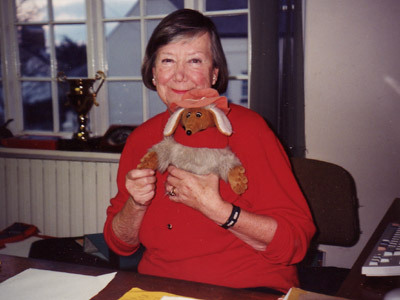 Within 10 years Elisabeth wrote over 20 Wombles books (translated into more than 40 languages), another 30 TV films and a Wombles stage show, one version of which ran in the West End. A vast range of Wombles products began to appear, including soap, T-shirts, mugs, washing-up cloths and soft toys. Elisabeth continued to write children’s books, many based on the small island of Alderney in the English Channel where she lived in a 300-year-old cottage in St Anne’s. 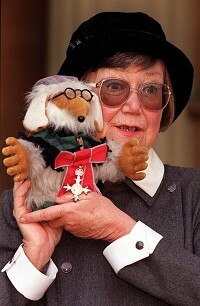 She was awarded an MBE for her services to children’s literature in the 1998 New Year’s Honours List. Elisabeth died on 24 December 2010 after suffering heart failure at the Mignot Memorial Hospital on Alderney.